The pants are hard to find and the shoes are very, very hard to find - especially the pink with glitter. 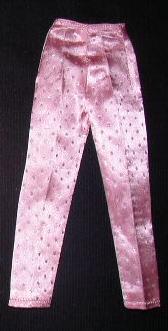 The pants in the rose pink color were also included in Satin ‘N Rose #1611 (1964). The black and white cloth Barbie tag was only included in one piece of an ensemble, and is found in the bolero in Satin 'N Rose. So if the slacks have the tag, they are the fashion pak item. If they do not have a tag, they are from Satin 'N Rose.